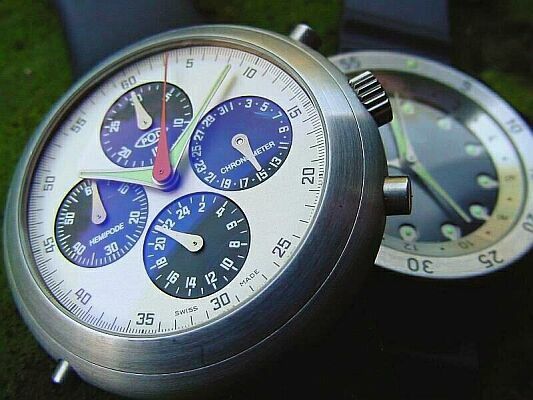 While the world of wristwatch design is ruled by the philosophies of Classicism and Functionalism, and permeated with the incessant repackaging and reinterpretation of a handful of iconic designs and elements resurrected from antiquity, not every wristwatch enthusiast is interested in past or presently common forms. For some, “tradition” is a dirty word equivalent with cowardice or a lack of imagination, and they demand new ways of seeing, preferring innovation and audacity to the safety of replication. It is this minority which continues to support the efforts of a few designers and manufactures that dare to go beyond the ordinary and accepted. 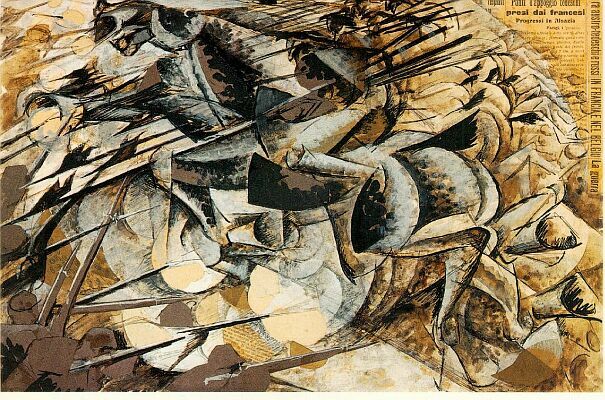 The Modernist movement of art and design itself has become a part of the established order, with the acceptance of mainstream museums, critics, and collectors. Consider that the “Art Deco” which once broke new ground, is now just another traditional form nearly a century old. Now within the new Gregorian millennium, we face a different world than the revolutionary Modernists of the late 19th and early 20th centuries. 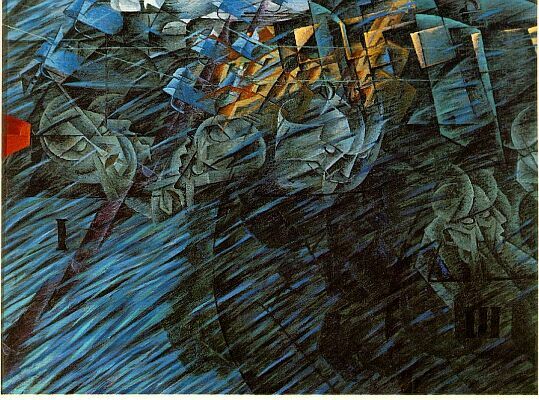 The industrial age which was only beginning then has been now been succeeded by an age of information and cultural fragmentation, a fragmentation that is reflected in the dissolution of Modernist ideologies into an individualistic Pluralism of art and design. In these contemporary post-modernist designs of the post-industrial computer age, “Nothing is true” and “everything is permitted.” For those unbound by the conventional restraints of the classical Western tradition, and for those willing to go beyond the bland international style of consumer culture, the continuing struggle between function and design plays out upon a new, very personal battlefield. A self-described “architecte horloger,” Alain Silberstein has the closest ties of any contemporary wristwatch designer to the Modernist movements of the last century — including Cubism, Constructivism, and the German Expressionists. 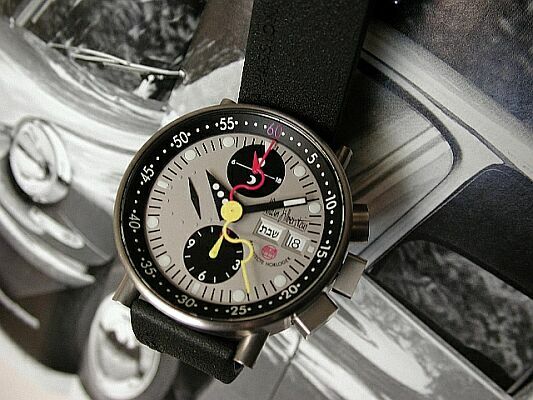 Since 1987 he has been producing his unique wristwatches under his own label, all in limited series, with a total output of less than 3000 watches per year. He now has his own art gallery in Paris to display his varied works, the Galerie Alain Silberstein. In looking to the Modernist past to create the future, Silberstein has merged facets of several related ideologies with his own unique flair and joie de vivre — the pure primary colours of blue, red, and yellow, and basic geometric forms. If nothing else, Silberstein can be credited with bringing “fun” to wristwatches, which for all of their history have been rather dour and stolid, even in their more “lyrical” forms. The watches themselves have a pronounced, unabashed presence. Large and bright, they are not inclined to hide under the cuff of one’s sleeve but instead announce themselves joyously to the world. While their designs are greatly varied, there is an underlying unity which makes his watches unmistakable even from across the room. Unlike most ebauche users, he does not rely on a single supplier but instead takes whatever may be useful from several — including Nouvelle Lemania, ETA/Valjoux, Frederic Piguet, and the newcomer Progress Watch. Furthermore, he works with the manufactures to modify these movements with novel complications and signature structural changes — like the serpentine chronograph lever pictured at left, and his signature skeletonized rotors. The finish of his movements is reminiscent of classical French movement finishing — a simple matte, though now nickel or rhodium plated rather than gilt. The steel or titanium cases are generallly fit with colour-coded push-buttons, and are occasionally covered with leather or “gummy” rubber, or bejwelled with precious or semi-precious stones. The complications vary from the common — chronographs, alarms, complete and perpetual calendars, to the uncommon — tourbillons, dual calendars in Gregorian/Hebrew and Gregorian/Islamic, and Svend Andersen’s unique display complication which shows the time digitally in a window in the side of the case. American designer Jeff Barnes. With the intent of creating something completely different from what was already available in the market, he developed a handful of striking designs that evoke the sense of an alternate path of evolution in wristwatch design. S.A. While there is great controversy surrounding the initial development of these watches, as can be seen above the dream was made a startling and vivid reality. The break-up of the Halter-Barnes collaboration might have doomed the future of these revolutionary timepieces, but the rights to the designs have been awarded to Vianney Halter, and the watches are now being produced and bear his name alone. further distances it from the mainstream (2 or 3 piece cases). The only apparent difference between the Antiqua and Contemporaine is that the latter’s movement, calibre VH 298, has four less jewels than the Antiqua’s calibre 198. 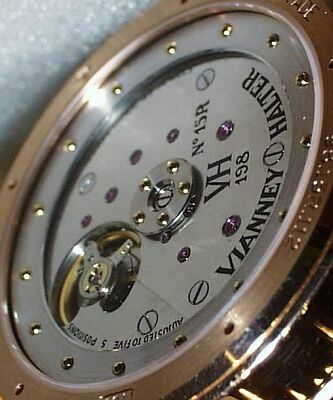 The beauty of the VH calibre 198 lies in that it is one of few truly modified ebauches in use today, with only about 30% of the original Lemania calibre 8810 remaining. The completely new 3/4 top-plate design is disguised by hiding the split between bridges in the shadow of a Geneva stripe — a split visible in the image at right. 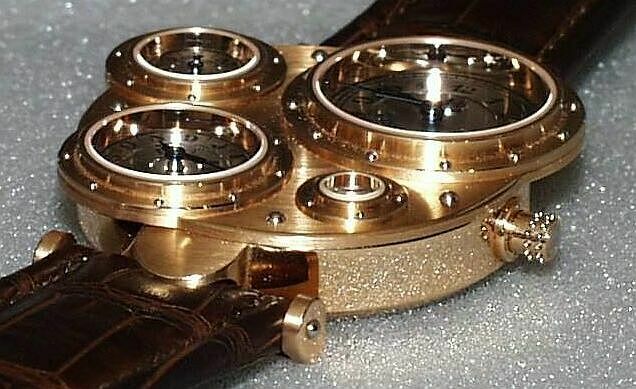 It is unclear who deserves credit for the Mystrieuse rotor concept, but it too is something unique to Vianney Halter wristwatches — a disk of sapphire crystal, with a white gold rim that is unevenly weighted. An almost conventional watch at first impression, Vianney Halter’s Classic is closely related to the Antiqua in both its case and dial design elements. The 36mm case is extensively punctuated with white gold rivets — 24 on the crown alone. Its VH calibre 100 is also based on Lemania calibe 8810, and it bears the Mystrieuse rotor . Another interpetation of the basic Antiqua concept is the rectangular Trio, which also uses separate dials for each function, though simpler in that it only has time, subsidiary seconds, and date indications. 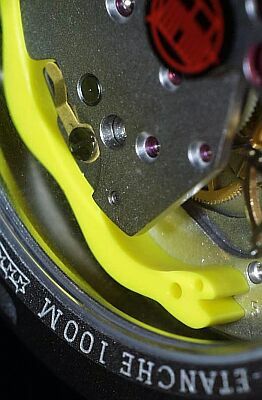 The movement, calibre VH 200, appears to be a nearly unmodified F. Piguet calibre 1161, bearing 33 jewels. Marc Newson might lead one at first to brand him as a Functionalist, but his work goes far beyond the egoless neutrality of the purely functional. He is a prophet of contemporary design, seeing beyond the stereotypically sterile ultramodern form to a fluidly organic, living-breathing transhuman vision. A vision of the future brought to fruition in his joint venture with Oliver Ike. Seaslug Divers UTC watch. With a demi-bathysphere case, sea anemone hour markers, and a barnacle-like raised texture on the outer circumference of the bezel, it is a unique departure from all that has gone before — not just another Rolex Submariner clone. 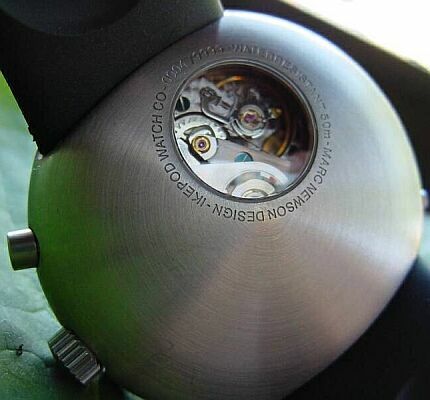 The brushed steel case is pressure reistant to 100m, and through the display back ETA calibre 2893 is visible. It is available with or without date, and with either a TMD hardened mineral crystal for actual diving, or a sapphire crystal. A new addition to the Seaslug line is the Seaslug Alarm based on Anton Schild calibre 5008. It exchanges the dive timer bezel for a world time bezel, has a rotatable inner 24-hour ring, and day and date indication. Not intended for diving, it is only 30m water resistant and a sapphire crystal is standard. strongest element of continuity is the monocoque case with ovoid profile and rear porthole. Made either in brushed steel or titanium, it is pressure resistant to 50m, and made in two sizes: 44mm (as shown at left) or 46mm. The primary Hemipode architecture appears to use a modified Valjoux 7750, substituting a date pointer subdial for the standard guichet date display, and a GMT subdial for the standard 12-hour counter — thereby achieving complete left/right and up/down dial symmetry. The Megapode Fly-Back retains the 12-hour counter and date guichet, but rotates the movement 180 degrees from normal in order to place the E6B flight computer control crown at the 3 o’clock position. There are a host of other variations including the simple chronograph Isopode, the Hemipode Grand Date, and a new Tourbillon based on the Progress Watch ebauche. modification and innovation as with Halter. Their watch making is not living up to the full potential of their design philosophy. The purpose of the avant-garde remains at least in part the opposition of the culture of mass production — a culture which by its nature must be predigested to the lowest common denominator for mass consumption. The avant-garde must also provide a counterpoint to the elitist cult of the Classical and the worship of ancient forms inherent in the Academic world. To “subvert the dominant paradigm” whatever it may be.